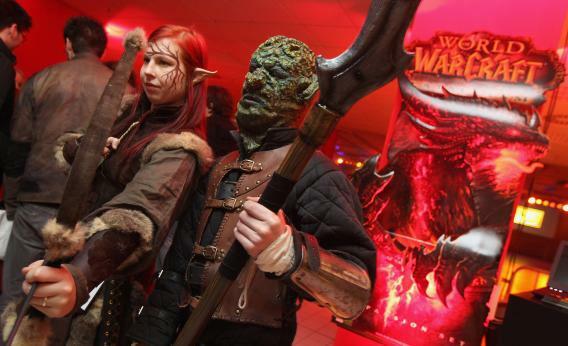 MMORPG like World of Warcraft can help or hurt a marriage. Gaming can bring a couple together. Massively multiplayer online role-playing games like World of Warcraft have been cited in several divorces in recent years. Now a study out of Brigham Young University attempts to look at what effect, exactly, MMORPGs can have on a marriage. Researchers identified 349 couples, then asked both spouses detailed questions about game habits and marital satisfaction. (Caveat: This study looked only at heterosexual couples.) They then divided the couples into two groups: those in which both spouses gamed, and those in which only one played. Some of the results are not terribly surprising: In couples where only one person—usually the husband—gamed, there tended to be higher marital dissatisfaction. Seventy to 75 percent of these couples said that gaming had hurt their marriages. This negative effect was particularly pronounced when the gaming spouse picked up the habit after the marriage, suggesting that if a wife sees her husband and his game as package deal before saying “I do,” it may be less damaging to a relationship. Professor Neil R. Lundberg says in a BYU press release, “It’s not the hours that make a difference. It’s really what it does to the relationship—whether or not it creates conflict and quarreling over the game.” The study also notes that one key predictor of marital happiness is whether a couple heads to bed at the same time. Since gamers usually log lots of hours at night, couples in which only one spouse played tended not to go to sleep together. Perhaps more interesting, though, is the results regarding couples that game together. According to the study, 76 percent of respondents from the “both game” group “reported that MMORPG playing had a positive effect on their marriages.” Part of the benefit came from interacting, via their avatars, within the online world. But! The positive effect was much more pronounced when the husband and wife did not belong to the same guild, clan, or group. The researchers note, “Being in the same group with individuals of significantly different ability levels may lead to potential conflicts and poor performance as a group.” So if the husband is a much more skilled World of Warcraft player, he may become frustrated with his wife’s mistakes, and she may resent his resentment. Sharing the hobby, but not depending on each other for in-game performance, was the ideal combination.